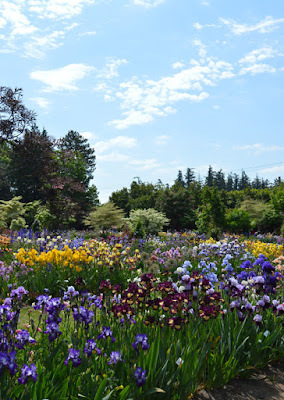 In spring of 2018 I had the good fortune to take a day to travel to Salem, Oregon and visit the amazing Schreiner's Iris Gardens. 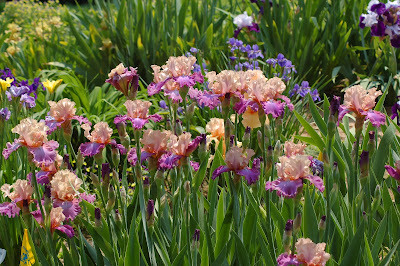 Schreiner's is one of America's longest running commercial iris gardens, first established in 1925, and is still run by the same family. 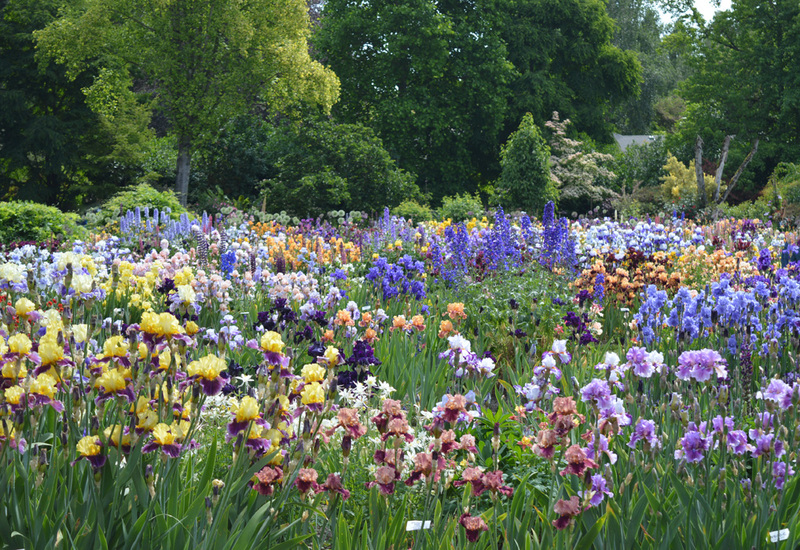 They are more than just fields of irises for sale tho - their display garden is renowned for its beauty, and is a favorite destination for iris lovers around the world. The gardens are very well thought out with companion plants that help showcase the beauty of irises in a garden setting, and I spent several hours enjoying the blooms and taking photos. I hope you'll enjoy this photographic tour of the display gardens, and if you ever get to Oregon in May do not miss your chance to experience the beauty in person. It is well worth the trip. 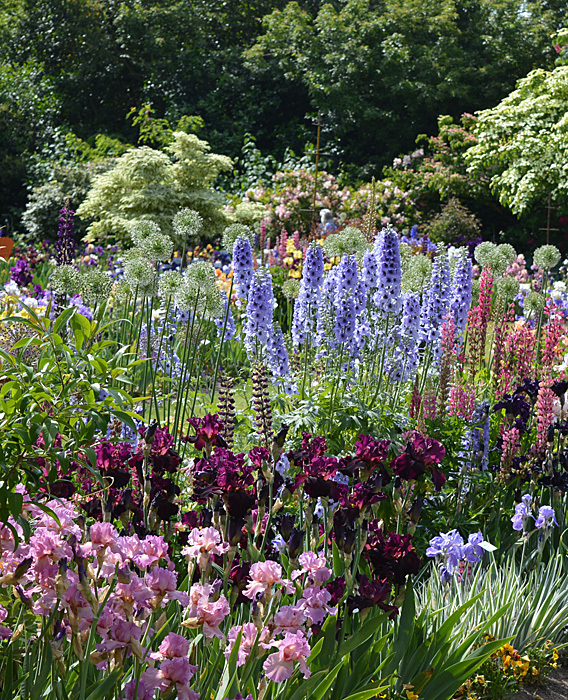 First up - garden shots. I normally don't like to have people in my photos but I made an exception for this gentleman. 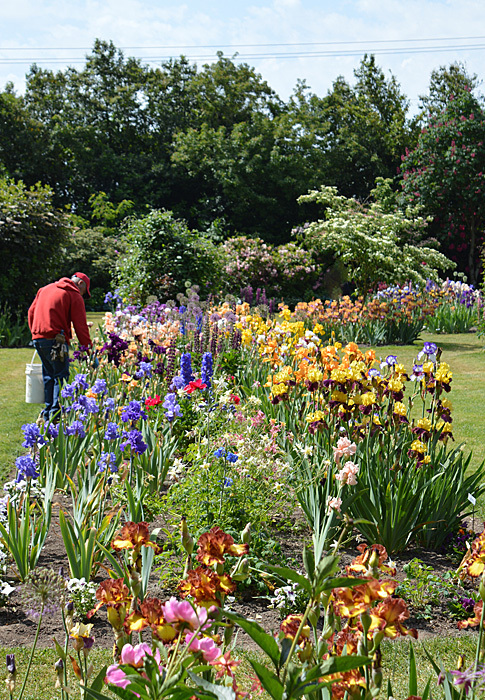 He has the enviable job of spending the day examining the flowers and deadheading the irises to make everything look as beautiful as it can for the visitors. A closer look at some of the irises. 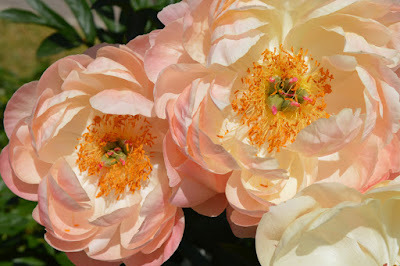 Varietal names are on the photos. 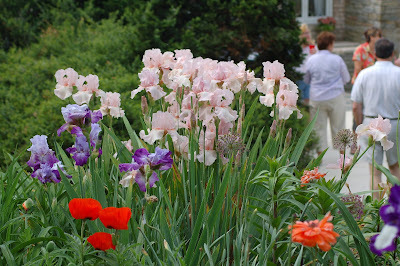 A closer look at some of the companion plants. I hope you enjoyed this brief tour. 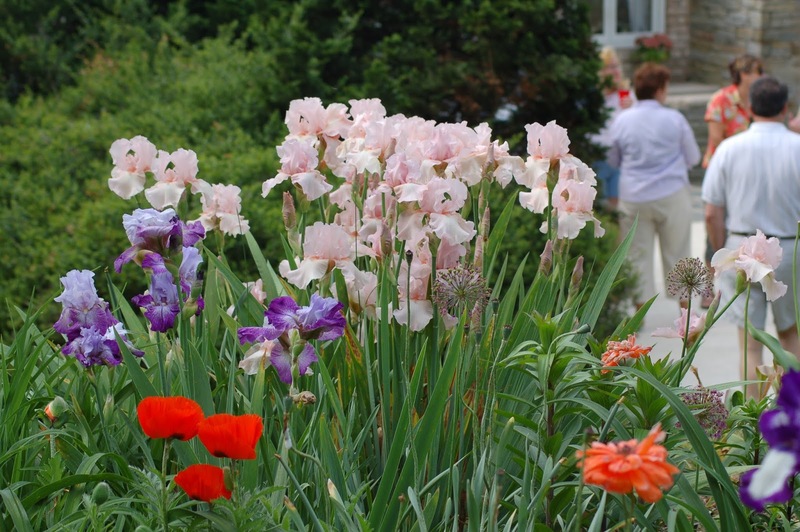 Every region of the American Iris Society holds a spring meeting, often including garden visits and irises planted specifically for the event. 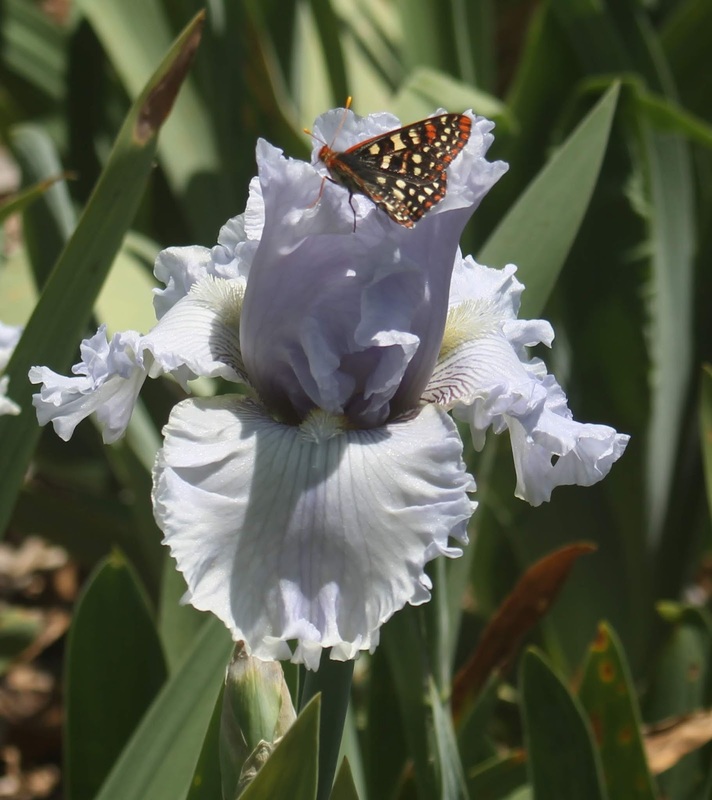 AIS Region 14 (which includes northern California, Nevada, and Hawaii) held its 2018 spring meeting, Butterflies in the Mountains, on May 11-13 of this year. The event was held in and around the town of Mariposa (the Spanish word for butterfly), located in the Sierra Nevada mountain foothills on one of the major routes to Yosemite National Park. 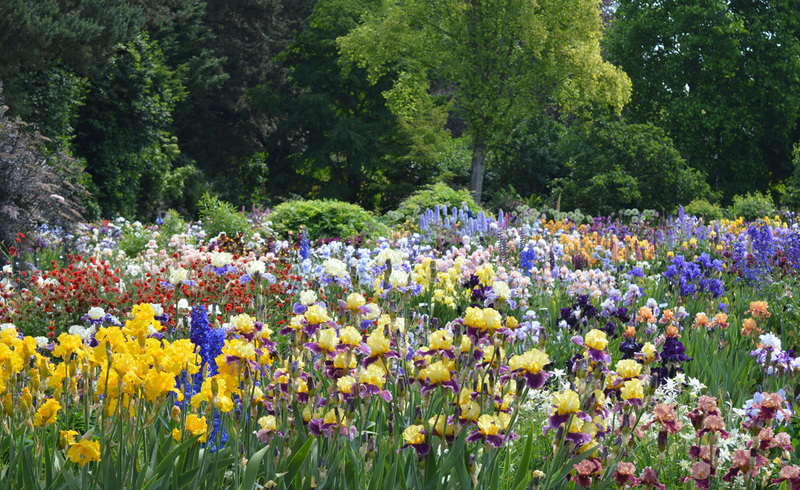 As the elevation of the tour gardens was around 3000 feet, the bloom season was a few weeks later than much of the rest of the region, affording irisarians some extra time in which to view their favorite flowers, and avoiding conflicts with other bloomtime events at lower altitudes. There were two tour gardens at this regional; the first we visited was Sky Ranch Gardens owned by Gary and Gail Collings in Oakhurst. The Collings have numerous rows of iris planted into a gently sloping hillside. 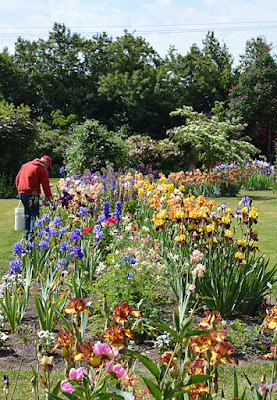 In addition to the guest iris, one aspect of the Collings garden I very much enjoyed was seeing their extensive collection of "recent historic" and "almost historic" iris - varieties from the 1980s and early 1990s, many of which are becoming difficult to find. 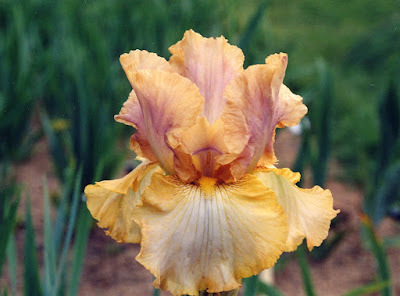 A number of these were also space age iris (with horns or other appendages on the beards of the flower), another favorite of mine. 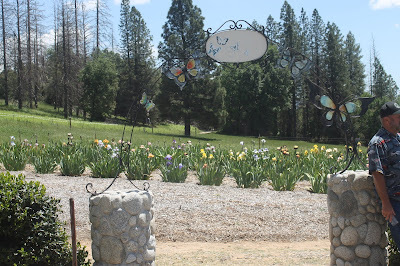 The second tour garden was the garden of Doug and Diane Kanarowski, located in the hills above Mariposa. In addition to many rows of iris, Doug and Diane have an extensive and beautiful garden around their home, with plantings of a wide variety of flowers, fruits, and vegetables, water features, a dovecote, and plenty of whimsy. 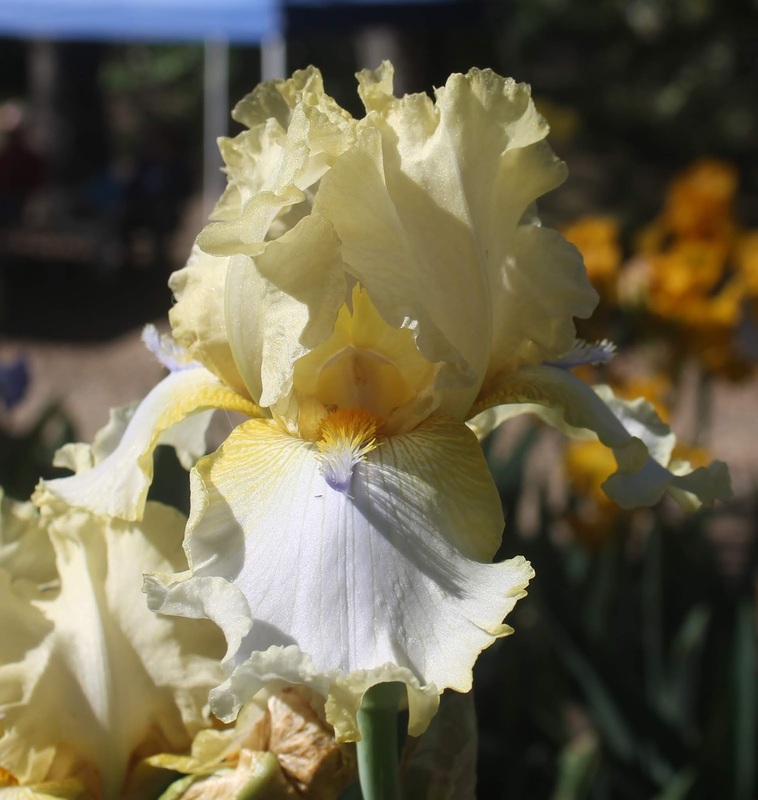 The beautiful pastel colors of Kanarowski's 'Baby Duck' won it the Clara B. Rees Cup for best iris introduced prior to the current year by a Region 14 hybridizer. Many thanks to AIS Region 14 for putting on an enjoyable regional! 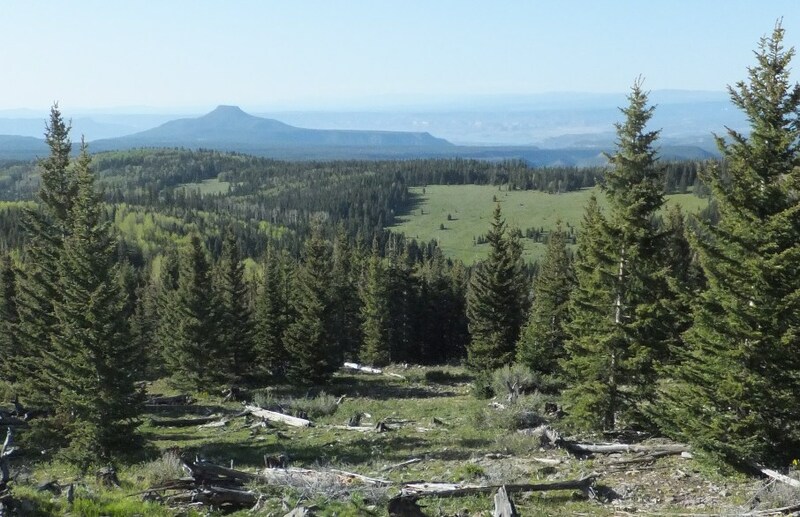 Thanks also to my wife Bonnie Petheram for providing nearly all the pictures for this blog (all except 'Zany,' which was my photo). 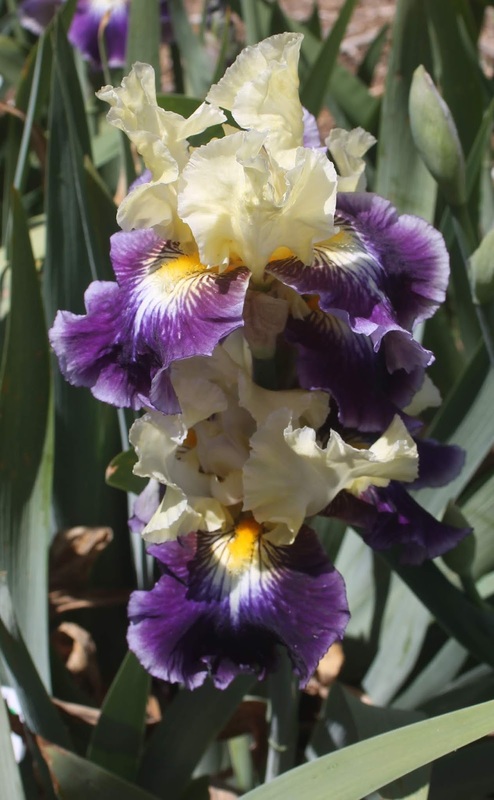 Joe Ghio has been hybridizing irises for more than 50 years and is the proprietor of Bay View Gardens in Santa Cruz. 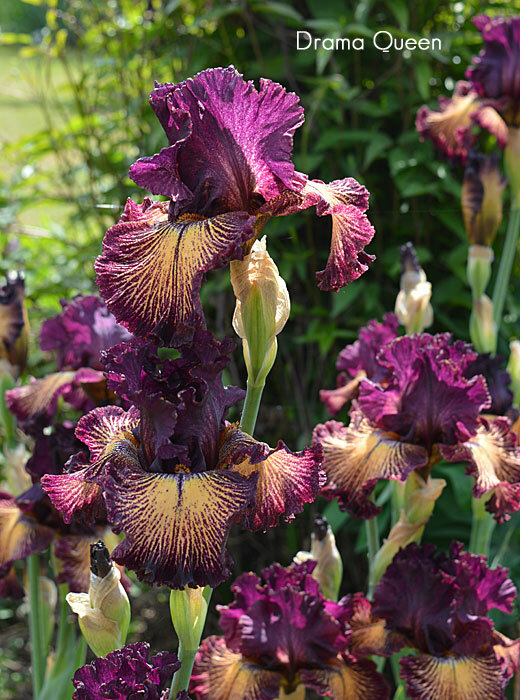 While he has dabbled in other types of irises including Spurias and Louisianas, he is best known for his work with tall bearded and Pacific Coast Native irises. 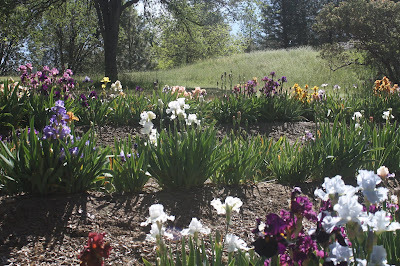 This spring I was able to not only visit the home garden—spread over a vacant lot and the backyards of the two house next to his house—but also the “farm” at Freedom, California. 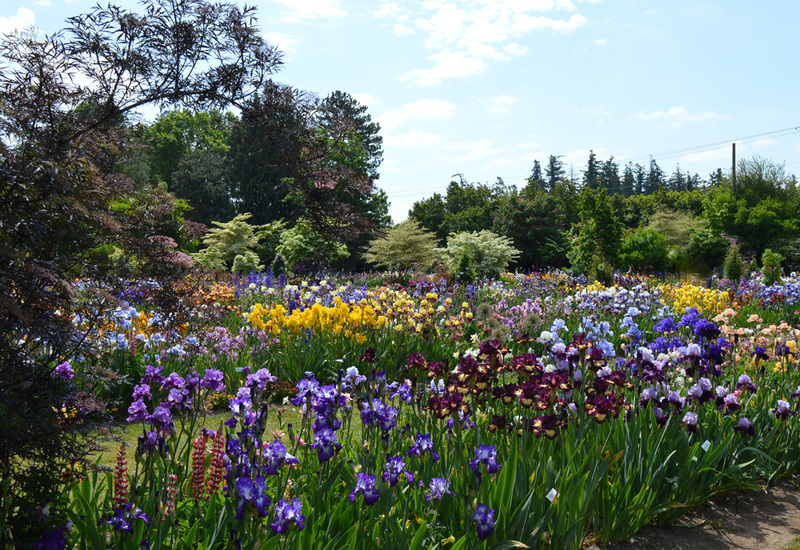 While part of the farm is rented out to a blackberry grower, Joe does have long rows of irises and seedling there. 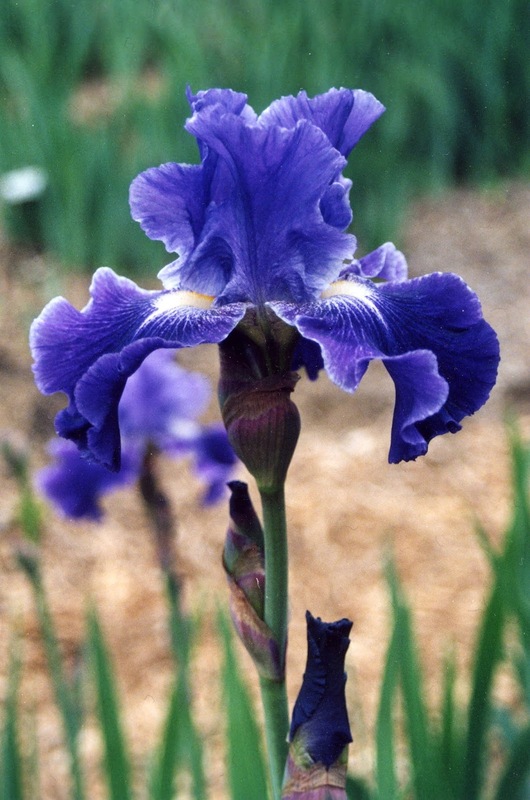 Joe was already an established hybridizer of tall bearded irises when he decided to breed Pacific Coast Natives. His foundation irises included seed and species collected in the Santa Cruz Mountains. In the early days when Joe first started working with PCN’s, the flower had thin petals. If I had scheduled a visit to see them and it rained or Santa Cruz had high winds, I would have to reschedule since the flowers would be tattered. 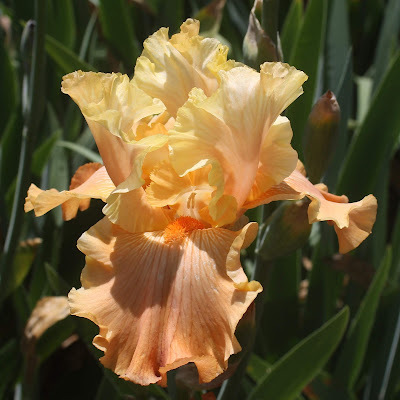 Not any longer the case—although still diploids, Joe has made major strides forward in flower durability and his recent hybrids hold up in wind and rain. And the other amazing thing is the array of colors today. 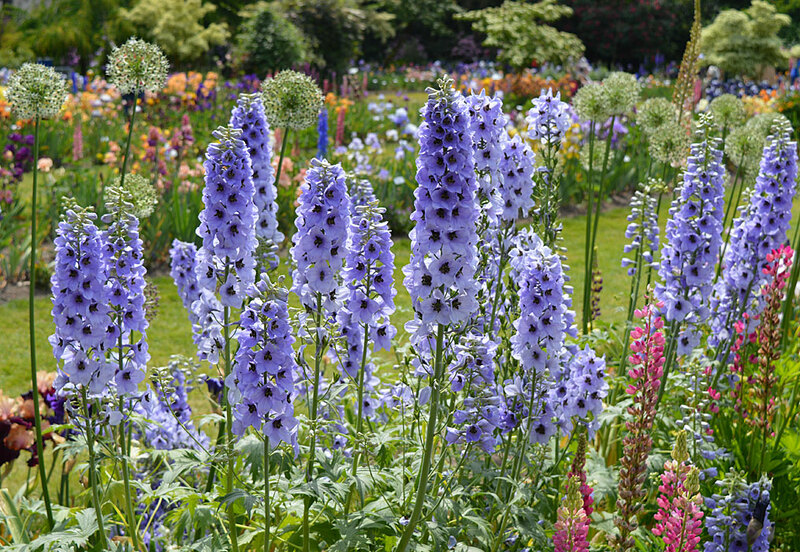 He has plicatas, bicolors, various lined flowers, and flowers with a contrasting eye at the heart of the flowers. 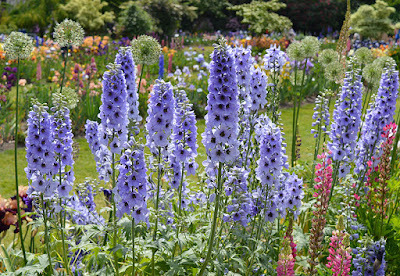 The soft yellow and blue combinations are especially interesting. With this work, Joe has revitalized the interest in this group of irises. 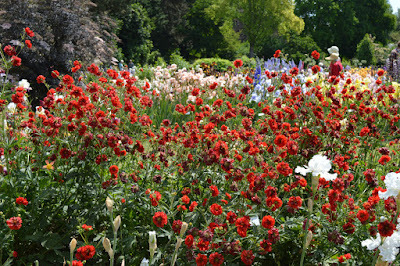 Sadly for many who will read this blog, the growing area for these lovely creations is limited. Two Northern California hybridizers in the last 50 years have had a major impact on flower form. I have written in the past about Joe Gatty’s lovely creations and Joe’s huge, flower form changing work has been with “bubble ruffling.” Gone are the plain, tailored flowers of yester year and in are flowers with deeply ruffling and fluting. Joe’s bubble ruffled flowers forced all other tall bearded hybridizers to work ruffling into their creations. Joe did win the Dykes Memorial Medal with ‘Mystique’, but I think judges missed another one of his early creations—‘Lady Friend’. I put it on the short list of irises that should have won the Dykes. 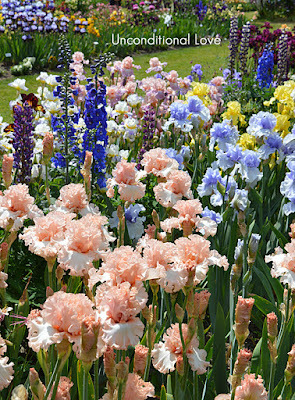 It is an enduring creation that continues to be very popular today and one of those unique colors that has not been duplicated. The following images are of some of Joe’s more recent creations. Any one interesting in buying from Bay View Gardens can send $3.00 for a color catalogue to 1201 Bay Street, Santa Cruz, California 95060. 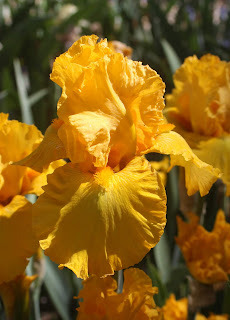 Joe ships bearded irises in July and August and PCN’s in late October or November. 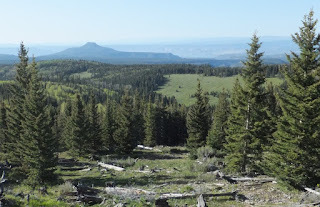 Editor’s note: This is the second part of my ‘On the Road Again’ blogs. 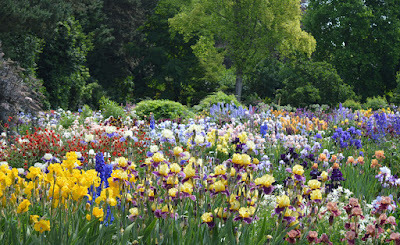 The pervious one was about Nola’s iris garden and next in line will be Fleur de Lis at Modesto, California. One of the goals of an iris hybridizer is developing new hybrids with richer colors and new color patterns. When we crossed 'Damsel' with 'Queen Dorothy' one of the results was our 'Little John'. 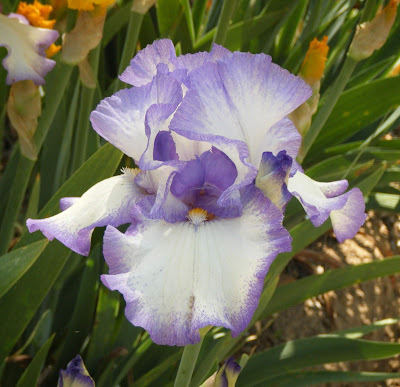 It was a cross of a non reblooming iris with one that was a reliable rebloomer (Queen Dorothy) in our colder zone 6. 'Damsel' is a lavender pink with a tangerine beard and has not been reported to rebloom in any zone, so that is what we call a rebloom carrier. 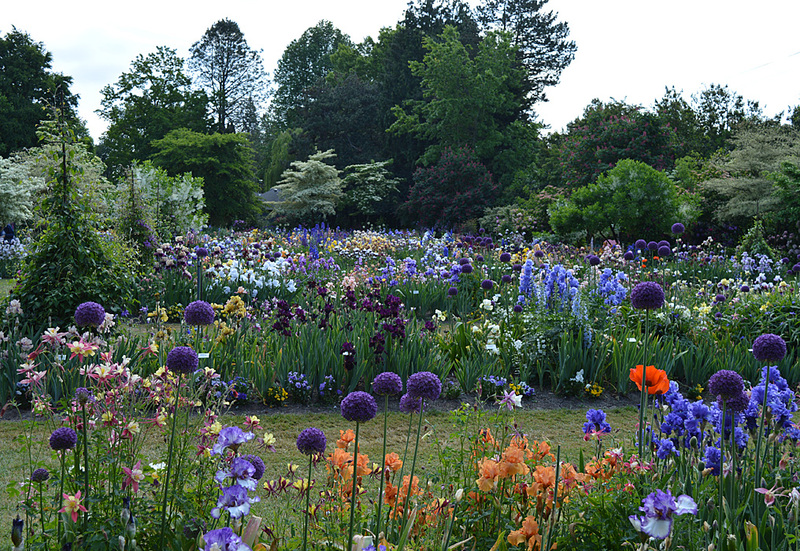 You can see by the photo that is where 'Little John' gets its lovely color combination. 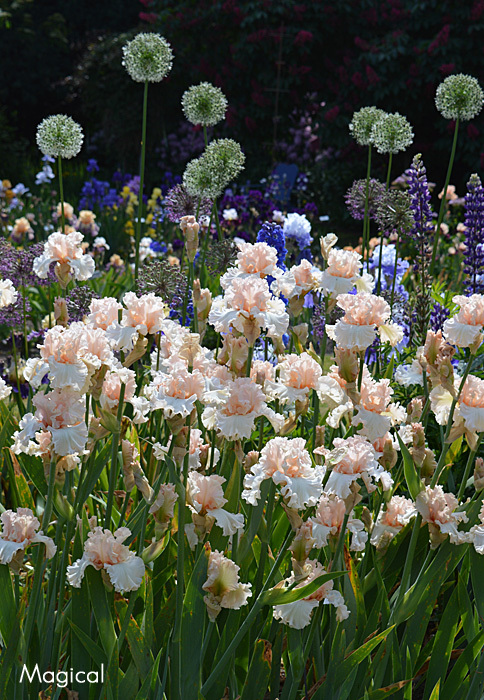 'Queen Dorothy' is a plicata and have gotten plicatas and variegated flowers out of crosses with 'Little John'. 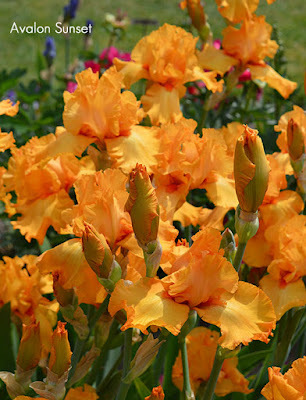 Taking our 'Little John' and crossing it with another warm climate rebloomer, 'Lady Juliet' (zone 7), we got our reliable zone 6 rebloomer 'Liquid Amber'. Don has long admired the West Coast hybridizer, the late Monty Byers, who used cold climate rebloomers for crosses with the warmer zone rebloomers to develop better form and color patterns. Raymond Smith from the Midwest and Lloyd Zurbrigg from Canada and then the east coast also used this method to produce more modern cold climate rebloomers. Our Wister Medal 'Daughter of Stars' is a good example of a cross with a cold climate rebloomer ('Clarence') by a carrier ('Mind Reader') producing not only a zone 6 rebloomer but a lovely luminata pattern as well. 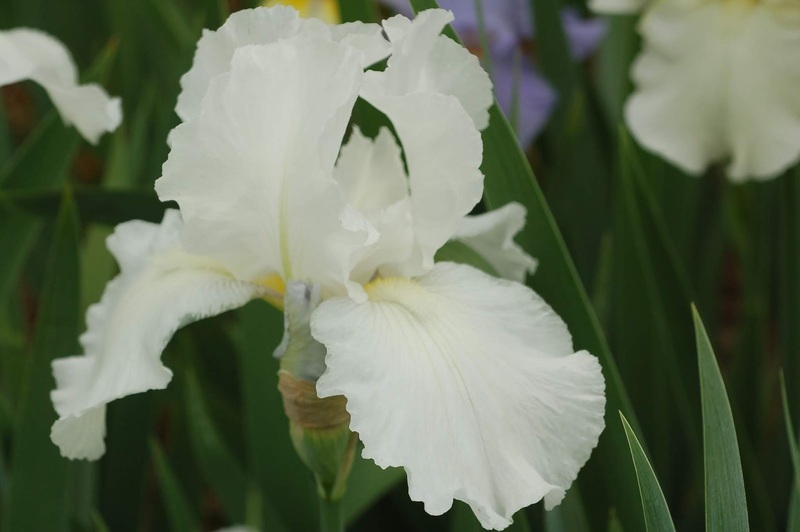 The lovely pink 'Vanity' by Ben Hager is another carrier that has been reported to rebloom in the warmer zones is in the parentage of many cold climate rebloomers. 'Starring' a beautiful non rebloomer by 'Daughter of Stars' produced a lovely cold climate rebloomer, 'Starring Encore'. Taking Midsummer's Eve X Fancy Woman (another carrier) we got BB 'Twiggy' a much better formed pink. Both 'Twiggy' and our 'Love Goes On', both prolific rebloomers here, have produced early rebloomers with more saturated colors and more modern form. 'Love Returns' (Twiggy X Love Goes On ) is a good example. 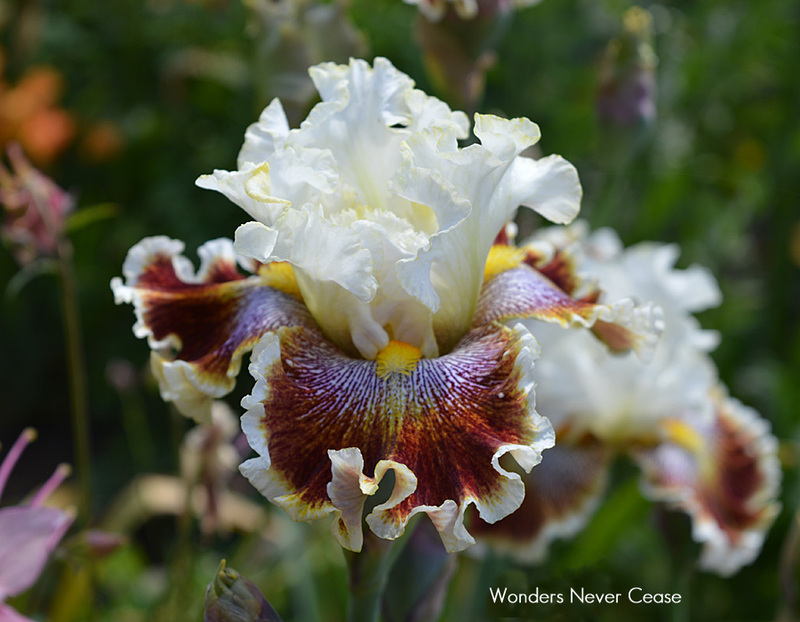 'Midsummer's Eve' has 'Immortality' in its parentage. 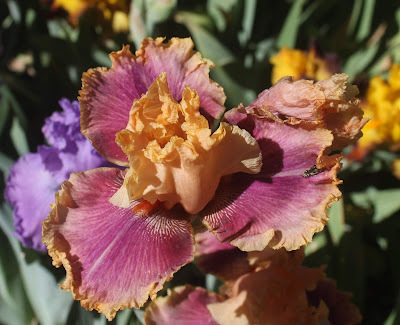 Don tried over 25 crosses of pinks with the cold climate rebloomer 'Immortality' before he finally got our BB RE 'Midsummer's Eve' While not the best form, 'Midsummer's Eve' has been the parent of many reliable and beautiful cold climate rebloomers. I have to relate a story about when 'Little John' was just a seedling. 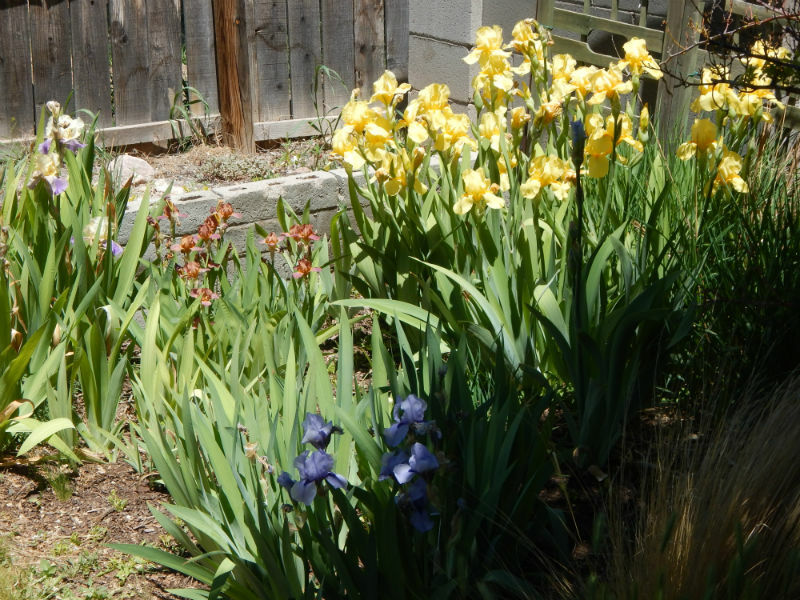 When Don was first hybridizing, and before we were married, he planted his seedlings surrounding his office of the Georgetown Observatory on the campus at Georgetown University in Washington, D.C. where he taught Biology and Ecology. He also planted his excess seedlings in the Historic Colonial Farm in Accokeek, MD just across the river from Mt. Vernon. 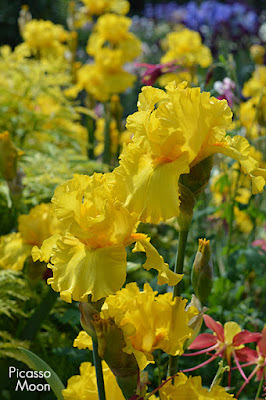 When the seedlings were blooming we would go and evaluate those we thought worthy of introduction. When I first saw 'Little John' it was love at first sight. We didn't have any tools with us and I wanted to take a piece home with me, but the ground was so dry that it was as hard as concrete. 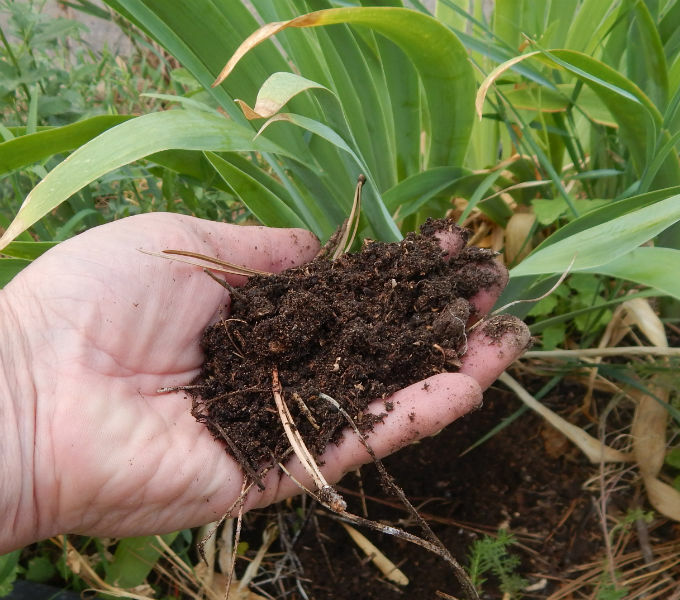 I would not be deterred so I took a rock and chipped out a few rhizomes and planted them in our garden in Cross Junction, Virginia. The next spring, we had a show stalk with 9 buds and perfect branching. Don said, "Get the shovel, we are going to get the rest!" 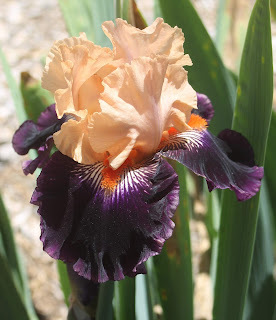 This is a cross of a reblooming seedling from Daughter of Stars X Autumn Explosion. 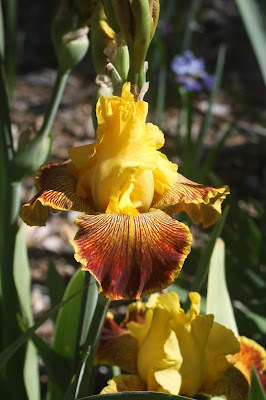 So, from a cross of a non rebloomer back in the parentage that produced a strong cold climate rebloomer, then crossed on another cold climate rebloomer, we have quit a lovely pattern and color combination on a reblooming iris.